Learning about recycling through activities is not only fun but essential to reduce trash on earth. 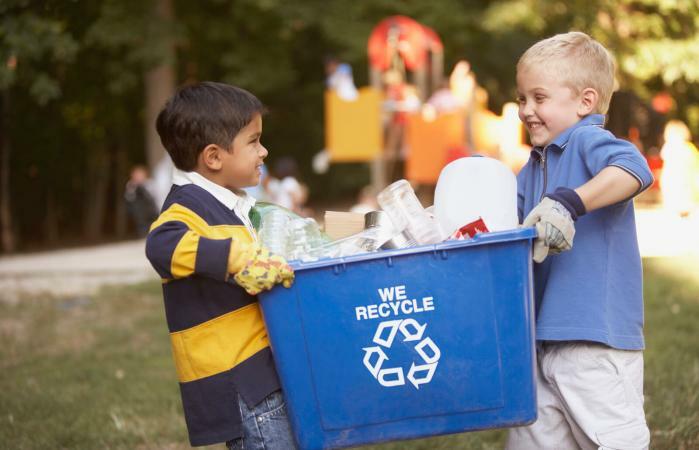 While some activities are more extensive, there are several ways to teach kids about recycling and reusing. Preschoolers like to play make believe. In this activity, you can help them to learn about recycling and have fun too. Allow students to use the art supplies to decorate the boxes. Help them to create a recycling symbol. Using the recyclable materials, show them how to put the materials in the boxes rather than in the trash. Give each kid different items and allow them to decide what goes in the recycle bin. For example, you could give them some empty bottles, paper and a pencil sharpener. Allow the kids decide what to put in the recycling bins. Allow them to play make believe as a recycling center. This activity allows students to decorate a recycling bin like a monster. The kids will then learn to feed the monster recyclable materials. This activity can work for kids grades kindergarten through two. Pass out the drawing paper and allow the kids to design a monster. If you have multiple children, you can have them design a monster and vote on the best one. Using the design, art supplies, tape and scissors, decorate your recycling bin like the monster. Find or collect recyclable materials like bottles, jars, etc. Have your kid feed the monster by putting the recyclables in the decorated bin. This activity will work best for older kids - typically third through fifth grade students. It can help them to understand why recycling is important because some things take longer to decompose. Give kids the board and various pieces of trash of different kinds (about 4 to 6 pieces). Have kids nail (with help from an adult) the trash to their board. Allow kids to make a diagram of the trash on the board with the paper and pencils. With help, have kids dig a shallow hole. Place the board in the hole and bury it. After a specific amount of time (2 weeks to a month) allow kids to dig up their board and look at the different rates of decomposition. They will notice that things like plastic haven't changed while the banana peel has. This is a fun activity that allows students to get creative. They can either use real trash or paper and pencil to figure out different ways to reuse materials like bottles and containers. This is a fun activity for fifth through eighth grades. However, you can modify it to work for younger ages. Discuss how recyclable material can be reused rather than thrown away. Hand out the paper to the kids. Tell them they have a laundry detergent jug, plastic bottle, and newspaper. Brainstorm three ways that each of these items can be reused rather than thrown away. On a new sheet of paper, pick one idea and explore it further. The solutions should include a diagram and information on how it can be used. This should be functional, like turning a lotion bottle into a cell phone holder. If you have the materials available, allow your kids to create their creation. Most times kids don't even realize how much recyclable materials they end up throwing away throughout the day. This activity for sixth through ninth grades can help them see the trash adds up. Give the kid/kids a journal to keep with them for 2 to 3 days. Document everything they throw away. They should only include things they throw in the trash. After the allotted time, analyze all the recyclable material that they have thrown away. Calculate how much trash was thrown away that could have been recycled. Brainstorm ways that each piece of trash could have been recycled, reused, or re-purposed. Create a plan for reducing your trash output using one of their brainstormed ideas. Use the paper and colored pencils to have kids make a poster based on their idea for reducing trash. Design a way to eat lunch without producing any waste. This works better for sixth through ninth grades. For 3 to 5 days, have kids document the trash that is thrown away during lunch. They should note food waste, plastics, etc. For example, the wrapper from a snack cake. Analyze the journal, noting the things that produce the most waste. Brainstorm ways to reduce that waste (i.e. using Tupperware or glass jars rather than prepackaged food). Using the paper, plan a waste free lunch plan. They should note all the foods that are in the lunch and how everything will be carried and disposed of. (i.e. using reuseable water bottles for drinks, reusable containers, reusable straws, etc.). Teaching your kids about recycling and ways to reduce the trash on the planet is important. Not only should they learn how to recycle but ways to reduce trash in general. These activities can work great with just one kid or a whole classroom.